A banned drug-driver has narrowly been spared from prison after he was caught behind the wheel and went on to urinate in a police cell. 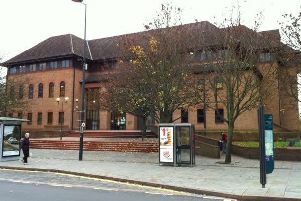 Chesterfield magistrates’ court heard on February 27 how Abrar Ahmed, 39, was seen by police in a Honda Civic in a poor state braking heavily and it was pulled over at Waingroves Road, at Codnor. Prosecuting solicitor Emma Heath-Tilford said Ahmed admitted having no insurance and he tested positive for drugs and he became abusive to the officers and he struggled with police as he was taken into custody. Ms Heath-Tilford added that Ahmed also urinated in his police cell and after he had given false details he then gave the correct details to the custody sergeant. Ahmed, who has previous convictions, pleaded guilty to exceeding the drug-drive limit for cocaine, damaging a police cell at Ripley station, driving while disqualified, obstructing a police officer and using a vehicle without insurance. Defence solicitor Ben Brown said the defendant has mental health issues and he had taken medication and also took cocaine after he had been hanging around with the wrong kind of people. Mr Brown added that he was caught driving after his friend had asked him to do so and the defendant had driven only a short distance to give his friend a lift. Ahmed, of Shortwood Close, Nottingham, claimed the mixture of his medicine and drugs had affected his behaviour, according to Mr Brown. Magistrates sentenced Ahmed to eight weeks of custody suspended for 18 months with a Rehabilitation Activity Requirement. He must also pay a £115 victim surcharge, £85 costs and £50 compensation. Ahmed was also disqualified from driving for 24 months.